Indonesia has called on ASEAN member countries to develop a unified position in negotiations on the Regional Comprehensive Economic Partnership (RCEP). 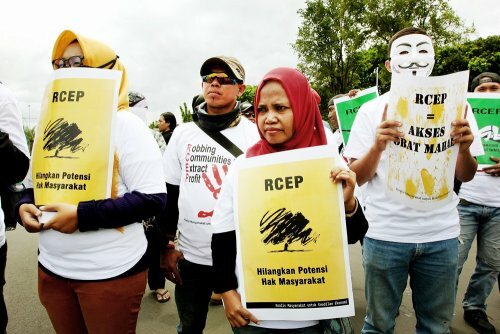 “ASEAN needs to have only one voice when negotiating with the partner countries in RCEP,” the Trade Ministry’s international trade negotiation director general, Iman Pambagyo, said in a statement received by The Jakarta Post on Monday. Iman chaired the Indonesian delegation in the second Senior Economic Officials’ Meeting for the 49th ASEAN Economic Ministers Meeting from March 21 to 24 in Nusa Dua, Bali. Iman stressed the importance of ASEAN member countries to discuss certain issues internally, before taking the issues to the RCEP forum. During the meeting in Bali, ASEAN member country representatives also discussed the results of the fourth RCEP ministerial meeting. During the RCEP Summit in Manila in November 2017, heads of state agreed to complete the negotiations this year. Iman called on the ASEAN member countries to commit to resolving all pending issues from the fourth RCEP ministerial meeting at the fifth inter-sessional ministerial meeting in Tokyo on July 1. The issues to be discussed include rules of origin, trade in services, investment and competition. The RCEP is a proposed free-trade agreement between the ten ASEAN members (Brunei, Cambodia, Indonesia, Laos, Malaysia, Myanmar, the Philippines, Singapore, Thailand and Vietnam) and six other countries — Australia, China, India, Japan, South Korea and New Zealand.